To support the UK’s future infrastructure needs, the Government should maintain a commitment to gross public funding support for infrastructure that meets the 1.2 per cent of GDP fiscal remit set for the National Infrastructure Commission, while examining the case for higher social and economic outcomes if this ceiling was to be raised. “We have, in this report gone beyond the usual approach of estimating the economic impacts infrastructure can bring, but instead have considered how its benefits affect people’s lives in different ways. The benefits of long-term infrastructure investment are clear. 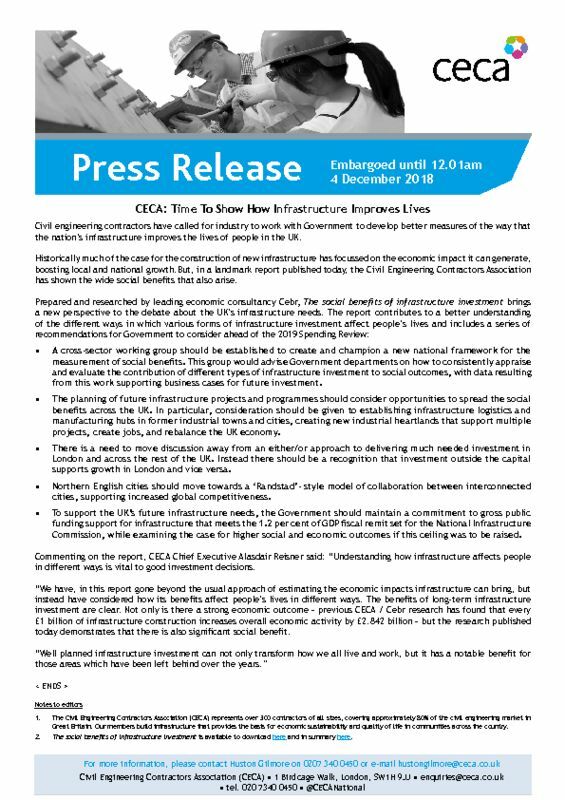 Not only is there a strong economic outcome – previous CECA / CEBR research has found that every £1 billion of infrastructure construction increases overall economic activity by £2.842 billion – but the research published today demonstrates that there is also significant social benefit.